The salivary glands, located in the mouth and throat, are responsible for producing saliva to keep your food moist, making it easier to chew and swallow. Saliva also aids in digestion, keeps your teeth from decaying and contains antibodies that keep your mouth clean and germ-free. Disorders of the salivary glands can interfere with these processes and lead to a variety of health problems. When the salivary glands become swollen and inflamed, symptoms such as dry mouth, difficulty swallowing, a bad taste in the mouth, pain in the face or mouth, swelling of the jaw and neck, muscle weakness or numbness and trouble opening your mouth widely can occur. Disorders of the salivary glands may be related to a variety of factors. Infections such as mumps are common, especially in children. Obstructions that limit the flow of saliva, causing it to build up in the ductal system and cause swelling, may lead to infection and, if left untreated, abscessed glands. Tumors can affect the salivary glands themselves or other areas nearby such as the palate, mouth, cheeks or lips. Other disorders affecting these glands include autoimmune diseases, diabetes and excessive alcohol consumption. 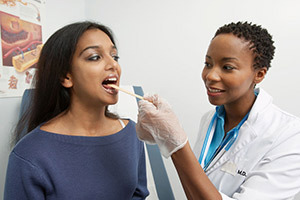 Your doctor will usually take either a medical or surgical approach for treatment of a salivary gland disorder, depending on the underlying cause and its progression. Any abnormal lump or swelling will require a biopsy to rule out the possibility of cancer. If you are diagnosed with a tumor, then surgery, radiation therapy, chemotherapy or a combination will probably be recommended. Surgery might involve removing a portion or all of the salivary gland and any cancerous lymph nodes. An otolaryngist familiar with salivary gland diseases is best equipped to come up with a suitable treatment plan and will make a recommendation based on your symptoms and condition.